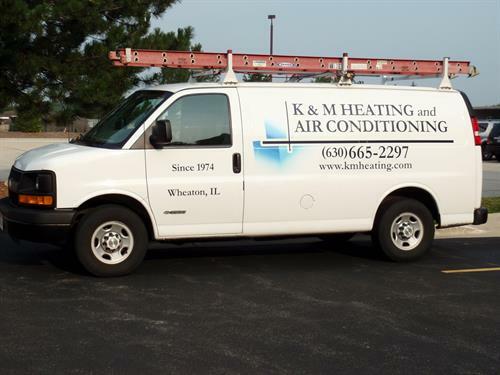 We are a professional residential and commercial heating and air conditioning company located in Wheaton since 1973. We service and install quality furnaces, air conditioning systems, humidifiers, duct work, boilers and piping. You may call us 24/7 for emergency service and our factory trained technicians will respond to heating or cooling problems. If your heating or cooling system is broke or old and just needs replacing, we over several top equipment manufactures for replacement options including Arcoaire, Bryant and Weil-McLain. K&M Heating has a complete sheet metal shop at our location for fabrication of duct work for your remodeling project or custom new construction work. We install several manufacture's products for your complete comfort in the home or office including high efficient air filtration, comfort zoning utilizing duct dampers with individual zone thermostats, Wi-Fi thermostats for control thru your smart phone, UV duct lights to control air purification, and whole house humidification. Call 630-665-2297 for service, maintenance, installation or you just need a question answered. Just North of Roosevelt Rd on Carlton Ave. and south of the railroad tracks near the prairie path.